Super fresh seafood and a good steak and chops menu in a modern atmosphere that won't break the bank. 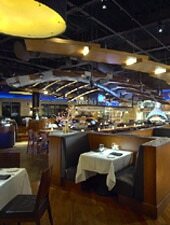 : Located at Newport’s The Bluffs shopping center, this restaurant has an ultra-sleek interior with soaring ceilings, touches of neon blue and classic dark wood tables. Seafood is flown in daily from all over North America and is prepared with classic French, California and Pacific Rim influences through full-size and small plate offerings. Start with the chef’s sashimi tasting or share the two-tier fresh seafood tower if you are dining with a group. We suggest a citrus-based cocktail with the tartare of Pacific ahi, which is prepared tableside. The kitchen’s mettle with seafood is demonstrated in dishes like the Parmesan-crusted north Atlantic lemon sole and the broiled Pacific swordfish steak that’s accompanied by Jonah crab, avocado and red-chili vinaigrette. There is a steak and chops menu, too. Two or three people can easily share huge side dishes such as pan-roasted wild mushrooms or roasted baby beets and candied walnuts. For dessert, try the hot pineapple upside-down cake with French-pressed coffee. The pricey wine list is adequate, but there are plenty of by-the-glass selections that won't break the bank.